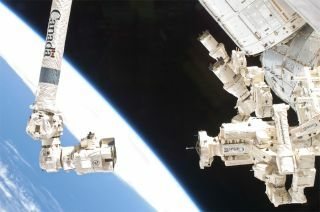 The International Space Station's two-armed robot Dextre is visible on right next to the Canadarm 2 robotic arm. A robot on the International Space Station has completed a job that until now has only been possible with spacesuit-clad astronauts conducting spacewalks. Late Monday (Aug. 29), the $200 million Canadian-built Dextre robot successfully removed a broken circuit-breaker box from the outside of the orbiting laboratory and replaced it with a new one. The box, called a Remote Power Control Module, controls the flow of electricity through the station's secondary power distribution system. Flight controllers on the ground operated the two-armed robotic handyman remotely. Meanwhile, the six astronauts currently living on the space station, whose job this normally would have been, slept. Dextre's work will enable them to devote most of their day to science experiments, NASA said. The accomplishment marks a major milestone for the Dextre robot, also known as the Special Purpose Dextrous Manipulator, which was built to reduce the need for spacewalks that can be risky and time-consuming. "Up to now, exchanging the boxes was done by spacewalkers, which always carries a certain level of risk," NASA officials wrote. "Dextre was designed to reduce the need for astronauts to conduct spacewalks for routine maintenance, therefore freeing up the crew's time for more important activities, like conducting science." The robot has an 11.5-foot (3.5-meter) body and two 11-foot (3.3-meter) arms. It was maneuvered around the outside of the football-field size International Space Station by the Canadarm 2 robotic arm. Later this week Dextre has another job relocating two storage pallets containing equipment that will be used during the upcoming Robotic Refueling Mission, an upcoming test of new technologies designed to allow satellites to refuel autonomously in space.